Not as widely grown in Australia as in Europe, Leeks are a slow growing vegetable that can be grown from seeds or seedlings. The interesting thing is that they are used almost as ornamentals in cottage gardens, they are after all the national floral emblem of Wales. So you could just plant a few in the ornamental garden if you like, they do have attractive foliage. They are easy to grow and this is why they are so popular, much easier than onions, so usually cheap, however growing your own is cheaper and you will have lovely fresh produce for the kitchen. Different parts have different flavours, the white lower stem is a sweeter milder taste than the upper leaves which are a stronger taste. Usually grown from seed and in cooler climates you can usually get two crops a year, one sown in late winter and one in late summer to autumn. Seed can be planted directly, or you might start the seeds off indoors during winter in a moist but free draining potting mix. Those white stems are produced by blanching, and this is done by planting in deep drills and adding soil as they grow, or ‘hilling up’ which means you mound the soil up as they grow. Grow leeks in a humus rich well drained soil in a sunny position. Seeds and seedlings can be planted in late winter to autumn. Weed and dig the area over well and add some well rotted compost and aged animal manure, a little blood and bone and a handful of lime for each square meter. A little nitrogenous fertiliser as well, leeks do like nitrogen. 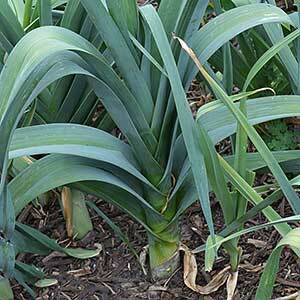 Ensure that the grange is good, leeks like moisture, but not wet soil. Prepare some long drills around 15cm deep and sow the seed directly, only cover lightly, as we are going to ‘hill up’ by filling in the trench as we go. If you have started the seeds of indoors you will have some shoots around 10cm long. Choose a cool spell and separate these, plant in the drills and as they grow back fill a little every 3 weeks. This covers the stems and keeps them nice and white. Water once or twice a week depending on the weather, more in dry spells. We use a liquid seaweed fertiliser, however we have also use ‘Miracle Grow’ with good results. Add a little fine mulch every few weeks as well, this helps with the blanching as will as keeping the moisture levels up. As you have prepared a good deep soil, harvesting is easy, simply pull them out as you need them. One trick is to part pull the leek out until you can see the roots, slice the upper part off at root level and push the roots back in. With a little luck you will get another leek, smaller, but just as tasty.